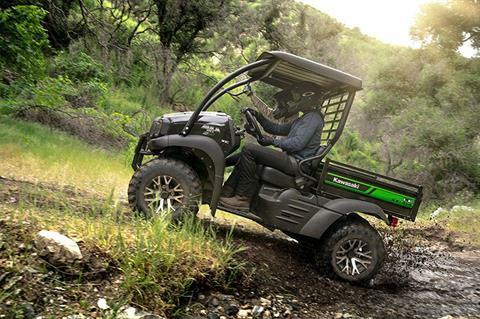 Packed with value and undeniable capability, the 2019 MULE SX™ 4x4 XC LE FI side x side is highlighted by a fuel injection system for easy starting, improved throttle response and consistent engine operation across a wide range of conditions. 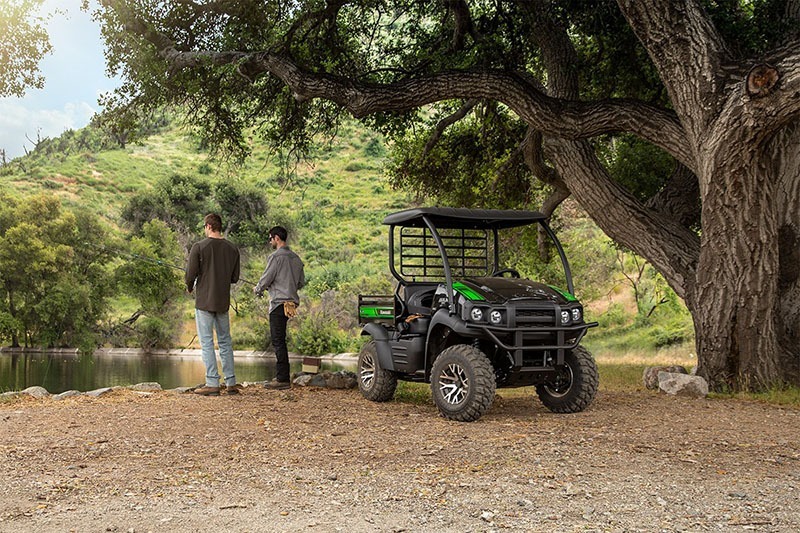 It comes equipped to work and play with enhanced comfort and versatility for all of your day-to-day activities. With large cast aluminum wheels and generous ground clearance, the MULE SX 4x4 XC LE is a durable and compact machine that’s capable of maneuvering in tight spaces and easily fits in the bed of a full-size pickup truck. 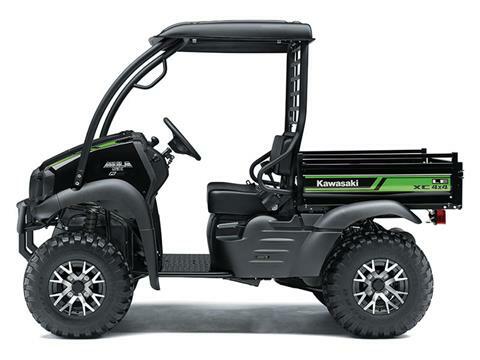 To top it off, it’s backed by the Kawasaki STRONG 3-Year Limited Warranty. 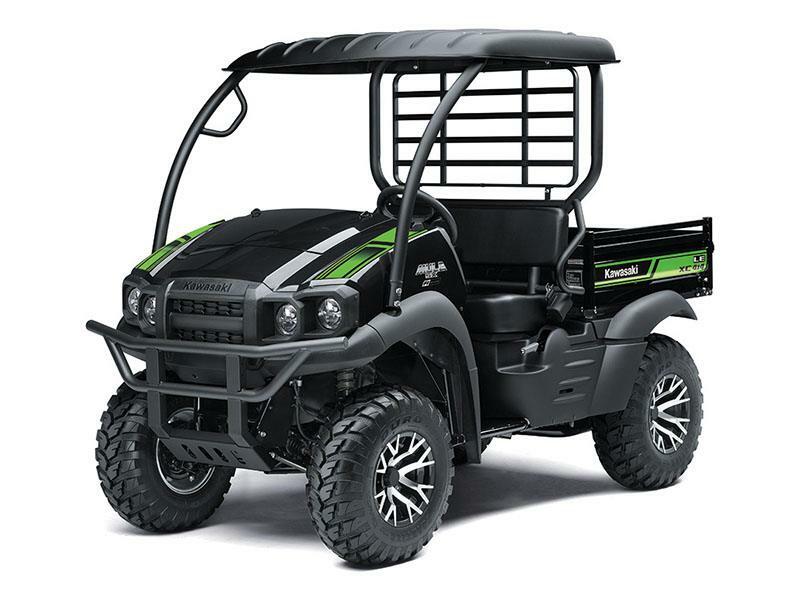 POWER: Powerful and proven 401cc 4-stroke engine with fuel injection for easy starting, improved throttle response and consistent performance across a wide range of conditions including elevation, temperature and terrain. 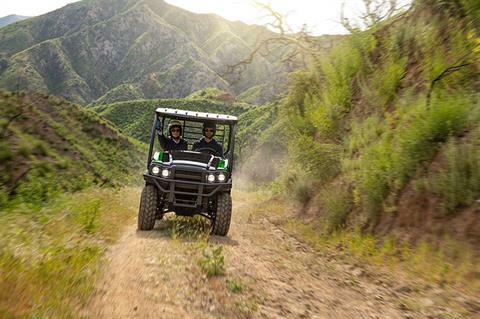 PERFORMANCE: Featuring selectable 2WD / 4WD to optimize traction in a wide range of conditions. 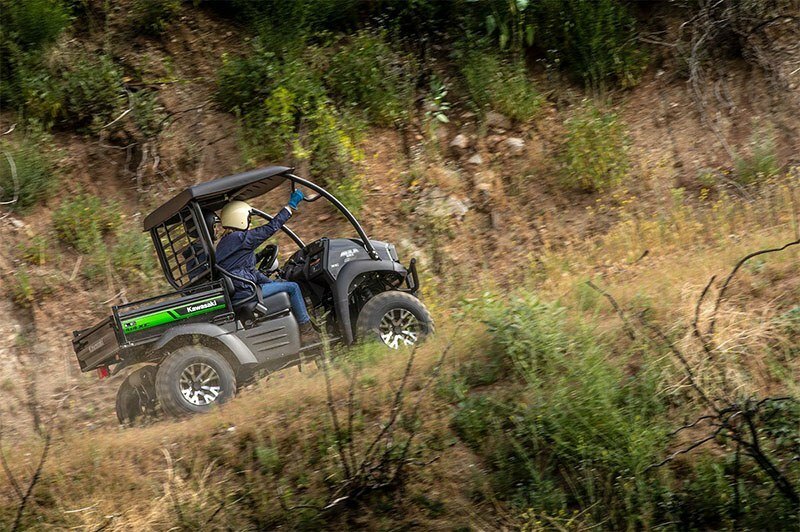 All models feature a lockable rear differential that allows rear wheels to have equal transfer of power for maximum traction in mud or snow. Rear wheel ground disturbance is minimized when unlocked. Limited-slip front differential for maximum traction, with low steering effort. Compact, narrow vehicle size and tight turning radius enables excellent maneuverability in tight spaces. ALL-DAY DRIVING COMFORT: Take on a long workday with a padded bench seat, and many other features that contribute to ride comfort. Adjustable tilt steering and premium thick grip steering wheel for enhanced driver comfort. Plastic sun top provides improved cabin comfort. Modern dash controls and fuel gauge placement are more centralized for optimal driver interface. Comfortable, padded bench seat and retractable seatbelts enhance occupant comfort. CONVENIENCE WITHOUT COMPROMISE: Rugged capability doesn’t mean sacrificing comfort and convenience. A large 16-gallon front storage compartment with removable lid allows for easy access. Stylish, textured dash-integrated switch blanks and audio system knockout location for easy installation of Kawasaki Genuine Accessory upgrades (sold separately). Easy-to-read dash-mounted fuel gauge and an easily accessible fuel tank for simple and convenient filling. Two handy cup holders designed to secure a wide range of common sized drink containers. 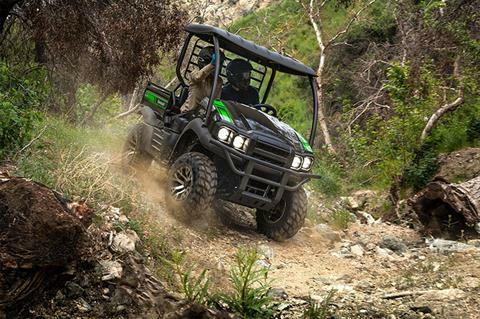 TOUGH AND DURABLE: Rely on the tough and durable MULE SX™ 4x4 XC LE to get your work done so you can venture on an afternoon ride. ROBUST SUSPENSION: MacPherson strut front and swing axle rear suspension is highly durable and delivers a comfortable ride for work and play. ENGINE & CVT: Compact, lightweight and durable, the 401 cc engine is a proven performer that delivers superb throttle response, smooth acceleration and rock-solid reliability. The automatic transmission makes it easy to drive. Simply select high or low range depending on your task and apply the gas. The CVT makes driving easy. AIR INTAKE: Fresh air intake positioned high on ROPS to draw the cleanest air possible from both sides for enhanced durability and performance. 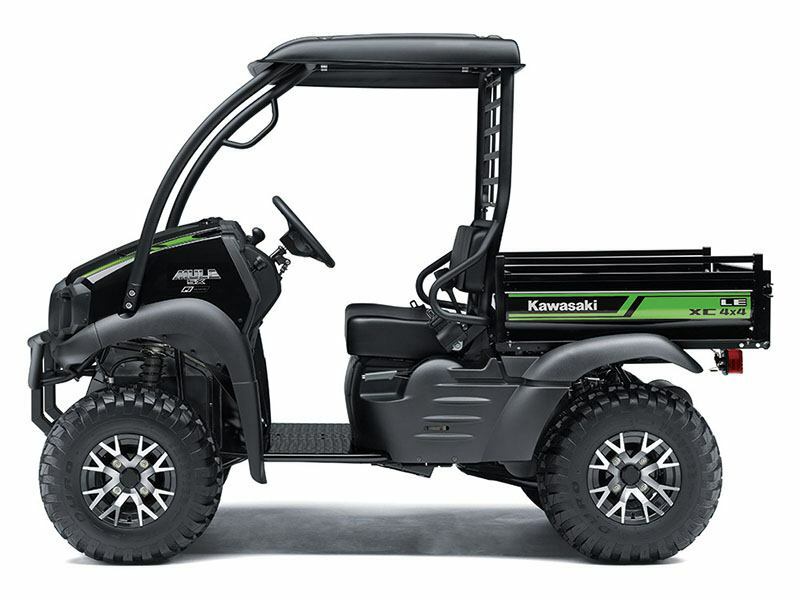 STRONG WARRANTY: Backed by the industry-leading Kawasaki STRONG 3-Year Limited Warranty. STRONG FAMILY RESEMBLANCE: The MULE SX™ 4x4 XC LE FI gets a tough and rugged appearance with its modern design—similar to the MULE™ PRO Series side x sides. Modern hood and grill design enhances the tough and rugged styling. Strong steel front bumper adds to the Kawasaki STRONG appearance. Large cast aluminum wheels and bold graphics add to the vehicle’s rugged look. 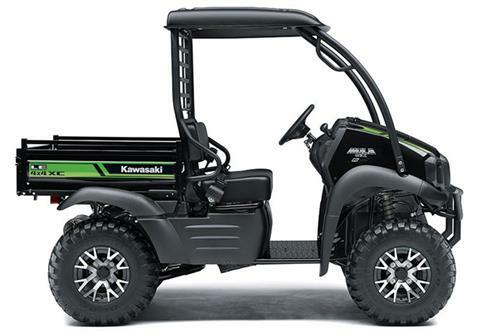 Square tube steel rear cargo screen provides improved rear visibility and resembles the MULE PRO look.